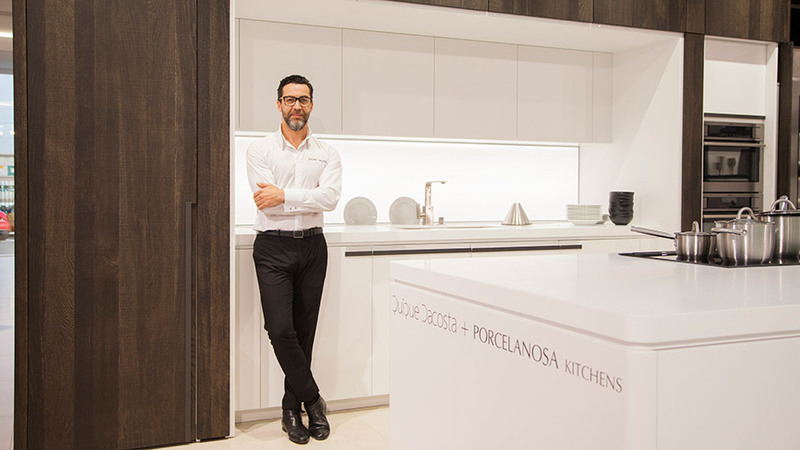 After its official presentation at the last edition of the International Exhibition of Global Architecture, the kitchen by Quique Dacosta for the PORCELANOSA Grupo makes its way to the United Kingdom. Great Britain, the precursor of the term ‘foodie’ and a loyal lover of professional haute cuisine, is the next destination for this modern and functional kitchen equipment, designed by the prestigious Valencian chef awarded with three Michelin stars. Dacosta has managed to join in a single kitchen design both his way of working and his professionalism, but at the same time, not forgetting his own style and language, fusion of creativity and culinary innovation with a taste of homemade food. 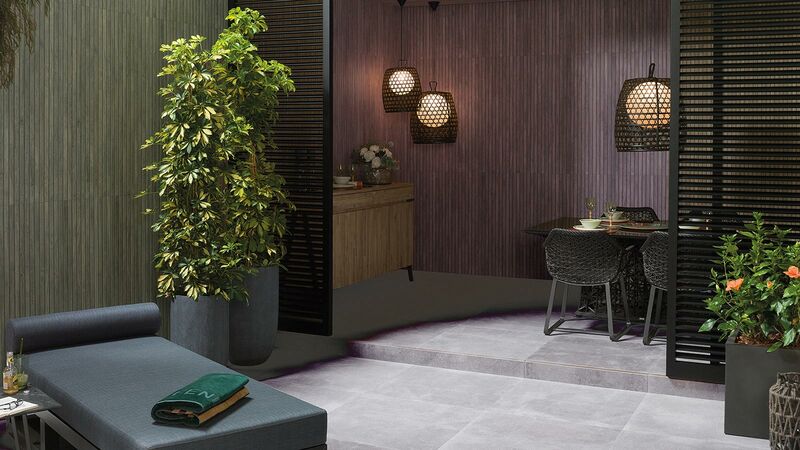 Also, the kitchen counts on the elegance and quality of PORCELANOSA Grupo’s materials, achieving, through this sensational collaboration between this firm and the chef, the perfect tool for both domestic use and the professional sector. 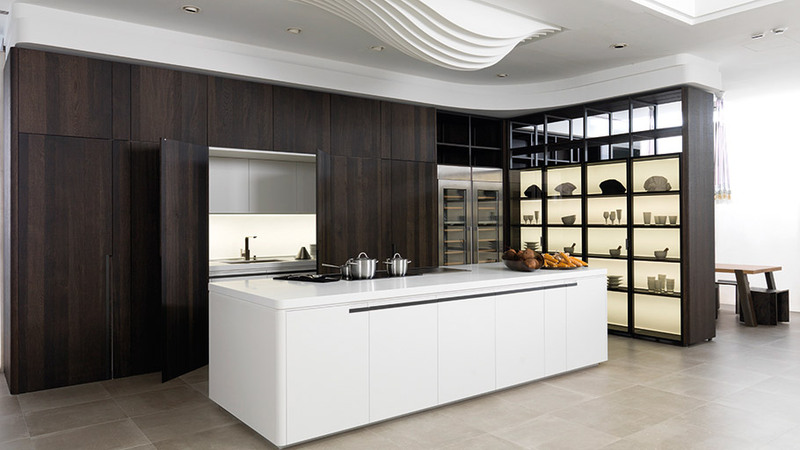 With regard to its design, the kitchen by Quique Dacosta for the PORCELANOSA Grupo consists of a large and spacious central island, with a pure white countertop and drawers with black handles. 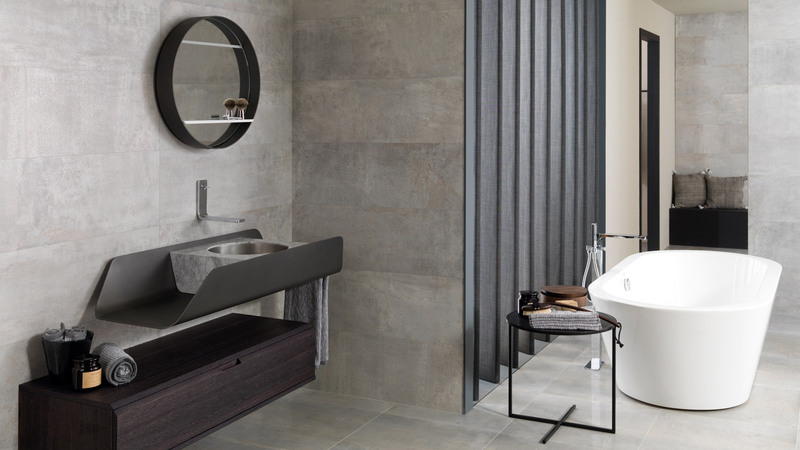 The 72 mm thick worktop has been made with the KRION® Solid Surface compact mineral, a highly resistant and antibacterial material. On the opposite side, there are sliding doors, capable of keeping the panel area hidden. Behind them, there is also a functional wardrobe area, whose material is made of oak wood in a carbon colour. In this space, lighting has been introduced through led installations, and it is possible to also enjoy several oak shelves, suitable for storage. 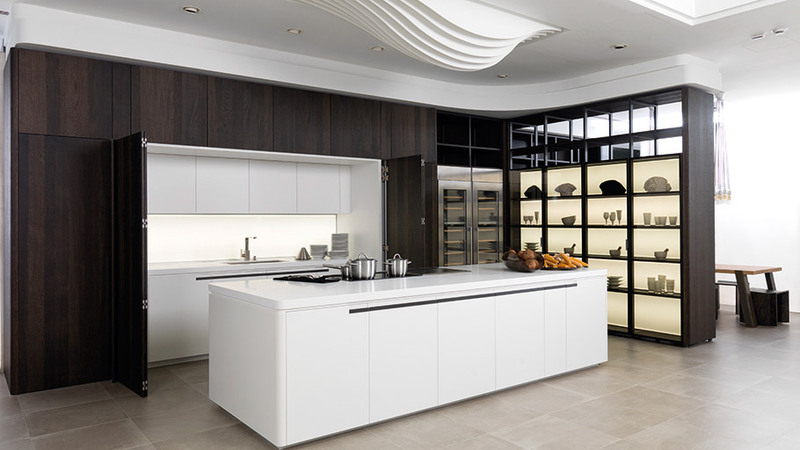 Undoubtedly, a kitchen in which every millimetre has been designed to maximize both space and functionality. 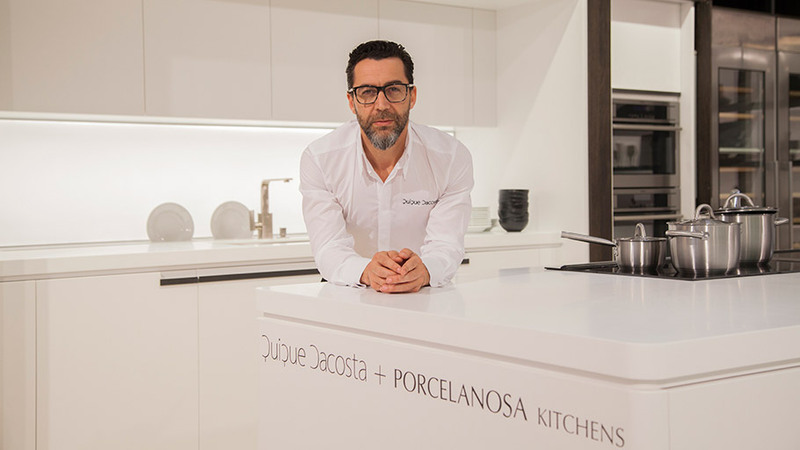 Regarding the collaboration between the PORCELANOSA Grupo and Quique Dacosta, it is the first time that this company has associated itself with a world-renowned chef, providing a professional kitchen for the domestic sphere. Do not miss our next event in the London showroom, located in Wandsworth Bridge Rd SW6 2TY, where Quique Dacosta will show new aspects, textures, sensations and flavours in modern cuisine for an exclusive English audience. Follow us on social networks so that you do not miss a single thing.